The UST and USTW series has been discontinued. Please see the OSTW as a possible alternative or contact our Temperature Engineering department. The OMEGA™ UST connector sets a new standard for thermocouple connectors! 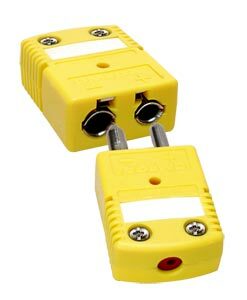 This standard size connector has all the necessary hardware to assure reliable connections with both round-pin standard and flat-pin miniature connectors. Nota: J, K, T, E, R, S and B are ANSI designations. OMEGALLOY ® is generically known as Nicrosil-Nisil.